On Monday, the Memorial of St Barnabas, Pope Francis reflects on three aspects of evangelization present in the readings of the liturgy: proclamation, service and gratuitousness. 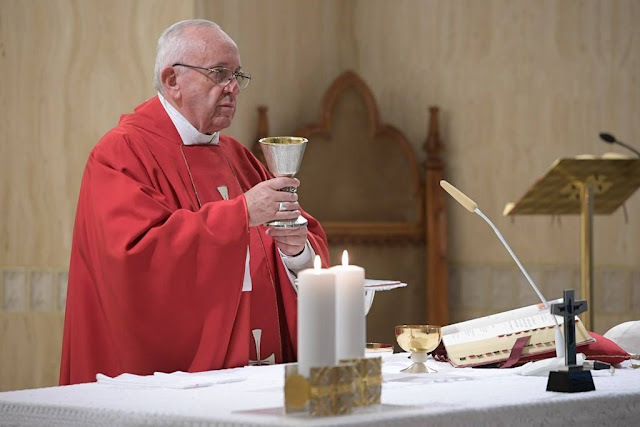 In his homily on Monday in the chapel of Casa Santa Marta, Pope Francis explained that evangelization has three fundamental dimensions: proclamation, service and gratuitousness. Proclamation The readings for the Memorial of St Barnabas (Acts 11:21-26; 12: 1-3 and Matthew 10:7-13) demonstrate that the Holy Spirit is the “protagonist” of the Gospel proclamation, Pope Francis said. That proclamation is unlike other types of communication. Due to the action of the Holy Spirit, it has the power “to change hearts”. There have been pastoral plans that seem to be perfect, Pope Francis said. “They were incapable of changing hearts” because they were ends in themselves. “They were not instruments of evangelization”, the Pope said. It is not with an entrepreneurial attitude that Jesus sends us…. No, it is with the Holy Spirit. This is courage. The true courage behind evangelization is not human stubbornness. No, it is the Spirit who gives us courage and who carries you forward. We can say good things but without service it is not proclamation. It may seem to be, but it is not, because the Spirit not only carries you forward to proclaim the truths of the Lord and the life of the Lord, but He also brings you to the service of the brothers and sisters, even in small things. It’s awful when you find evangelizers who make others serve them and who live to be served. They are like the princes of evangelization – how awful. Pope Francis presented gratuitousness as the third aspect of evangelization because no one can be redeemed by his or her own merit. The Lord reminds us, “Without cost you have received; without cost you are to give” (Matthew 10:8). All of us have been saved gratuitously by Jesus Christ. Therefore, we must give gratuitously. Those who carry out the pastoral work of evangelization must learn this. Their life must be gratuitous, given in service, proclamation, borne by the Spirit. Their personal poverty forces them to open themselves up to the Spirit.